Some students seem content to do the bare minimum; others delight in going the extra distance. Count current Department of Writing student Andrea Routley in the latter camp. 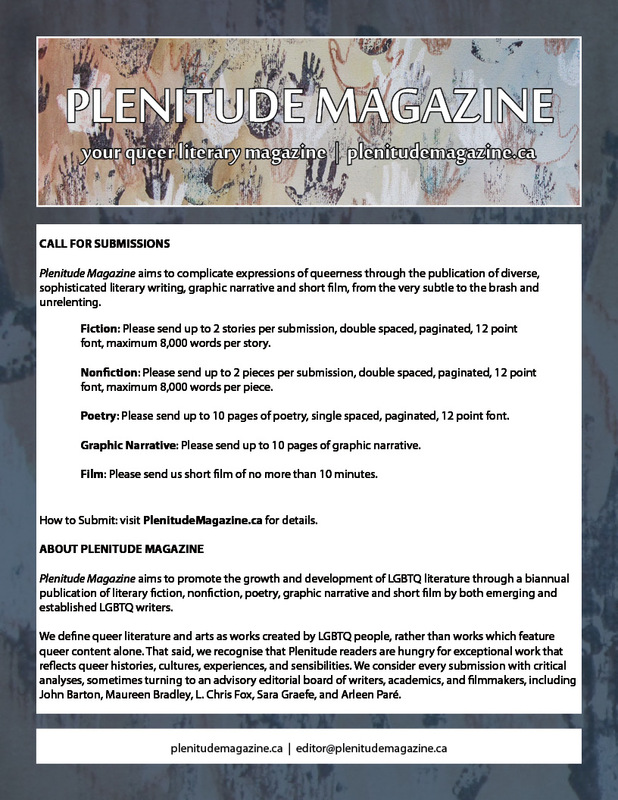 In addition to the regular requirements of undergrad life, Routley is currently in the process of launching Plenitude, a brand new online queer literary magazine. 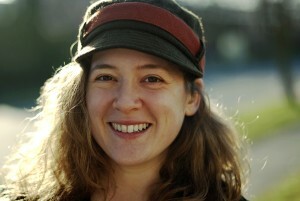 While there are plenty of queer books being published in Canada, Routley—editor of the 2010 collection, Walk Myself Home: An Anthology to End Violence Against Women (Caitlin Press) and a writer whose work has appeared in the likes of The Malahat Review and Monday Magazine—feels there’s still a place for a project like Plenitude. “These kinds of publications can’t take the place of a queer literary magazine, as much as any other ‘non-queer’ novel or collection could replace literary magazines in Canada such as The Malahat Review or Prairie Fire,” she says. “Literary magazines serve the much-needed purpose of fostering the growth of emerging writers and building communities of writers.” And while some literary mags have released specifically queer-themed issues, Routley (also a poet who was shortlisted for the 2008 Rona Murray Prize for Literature) doesn’t feel that fills the same need for writers. 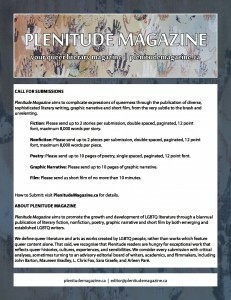 Plenitude began as self-directed study for UVic’s Department of Writing and will operate under the mentorship of Lynne Van Luven, with technical assistance by Faculty of Fine Arts digital media technician Cliff Haman. (The advisory editorial board also features the likes of Malahat Review editor John Barton, filmmaker and Writing prof Maureen Bradley plus PhD L. Chris Fox, playwright Sara Graefe and author Arleen Paré). But Routley’s vision for Plenitude involves more than just reading text online—as well as the usual fiction, nonfiction and poetry, her call for submissions also includes short films (10 minutes max) and graphic narratives (10 pages max). 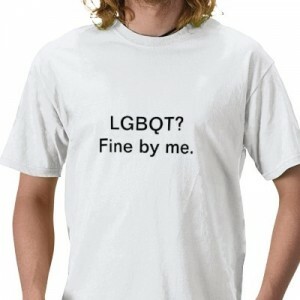 Routley will also have a Plenitude table at the Victoria Pride Society’s annual LGBQT literary event, Pride & The Word, on July 7 at Ambrosia Conference Centre on Fisgard.